Melasma is presumed to have a multifactorial origin with a complex interplay of genetic predisposition, exposure to ultraviolet radiation and visible light, hormonal imbalance, angiogenesis, and drugs. Despite the availability of a wide range of therapeutic options, it is difficult to achieve satisfactory response and long-term remission. Hence, the quest for a novel therapeutic molecule is the need of the hour. Topical depigmenting agents have been the standard of care for the treatment of melasma for a very long time now, and hydroquinone (HQ) has been one of the most extensively studied depigmenting agents. Tranexamic acid (TA) has recently been proposed as an effective alternative in the treatment of melasma. It can be administered through topical, intradermal, and oral routes. 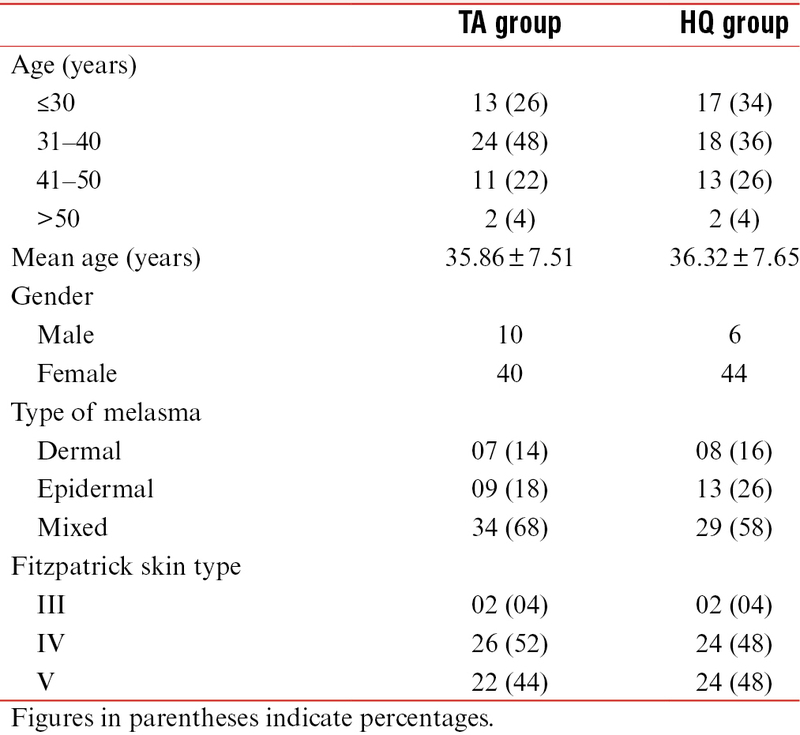 Though there are no extensive studies conducted on topical TA, the preliminary reports have been promising.,, There is a paucity of data on the efficacy and safety of topical TA in the Indian subcontinent, and this study aimed to evaluate the efficacy of topical 5% TA in melasma and compare it with the gold standard molecule 3% HQ in Indian skin type. This was a prospective, single-blind, randomized study conducted for 1.5 years at a tertiary care hospital in Bangalore. All new cases of melasma more than 18 years of age and previously treated cases of melasma who were off topical and systemic therapy for at least 1 and 3 months, respectively, before the entry into the study were included. Pregnant and nursing women, patients on contraceptive pills, photosensitizing drugs, and those with history of hypersensitivity to HQ or TA, deep venous thrombosis, myocardial infarction, stroke, chronic kidney disease, and defective color vision were excluded. After obtaining a written informed consent, a detailed history and examination of eligible patients was documented by a single examiner with blinding. Patients were assessed to determine the Fitzpatrick skin type and were examined under Wood’s lamp to identify the type of melasma. Baseline investigations such as platelet count, prothrombin time and activated partial thromboplastin time were performed for all the patients to rule out any active coagulation disorder. They were subjected to simple randomization, allocated into two groups, and administered topical 5% TA solution and 3% HQ cream, respectively, for once daily local application and a sunscreen of SPF 30 for a duration of 12 weeks. Topical 5% TA solution was prepared by diluting TA injection (10%) with sterile water. Digital photographs, Melasma Area Severity Index (MASI), and adverse effects were collated by a single examiner periodically. Subjective improvement was assessed by patient satisfaction score at the end of the study. A repeated measurement analysis of variance, independent t-test, Cohen’s d, and χ2 tests were used to analyze data in SPSS 16.0 software. A P-value of <0.05 was considered to be statistically significant. A total of 346 patients of melasma were assessed for eligibility. About 120 patients satisfying the aforementioned criteria were included in the study. Final data of 100 patients were analyzed after excluding the patients who were noncompliant and lost to follow-up [Figure 1]. The clinicodemographic characteristics of the study subjects are summarized in [Table 1]. Majority of the study subjects were less than 40 years of age and had melasma for a duration of 1–3 years. The mean MASI at baseline in TA and HQ groups was 12.39±3.34 and 11.63±3.72, respectively. However, after 12 weeks, mean MASI reduced to 9.47±2.79 and 9.24±3.26 in TA and HQ groups, respectively [Figure 2]. Percentage reduction of MASI in TA group was 27% and in HQ group was 26.7%, and the difference in the reduction between the two groups was not statistically significant (P > 0.05). A significant decreasing trend was observed in MASI scores at 4, 8, and 12 weeks in both the groups during the study (P < 0.05). There was no difference in terms of onset of action and rapidity of clinical improvement in both the groups. The evaluation of the intervention magnitude at the end of 12 weeks with reference to effect size was considered “large” within the groups, TA group = 0.94 and HQ group = 0.68, but “small” being 0.08 when compared between the groups. 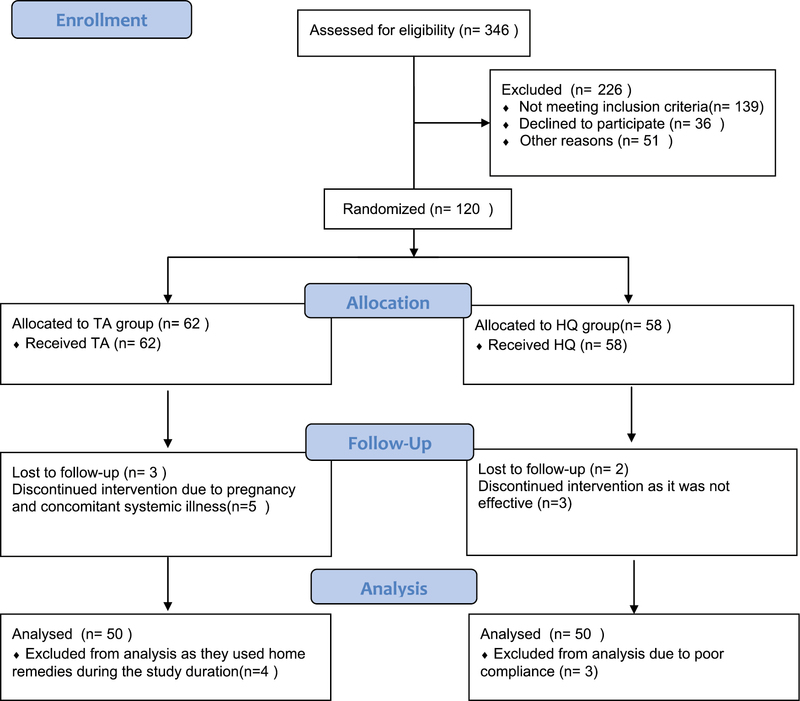 Patients treated with HQ had a significantly higher incidence of adverse effects [Table 2] and patient satisfaction score was significantly better in TA group (P = 0.03) [Table 3]; [Figure 3] and [Figure 4]. Therapy in melasma focuses on sun protection, withdrawal of triggering factors, and reversal of pigmentation. HQ has been regarded as the gold standard in the treatment of melasma for over five decades now. Despite its local adverse reactions, its efficacy has been unquestionable both alone and in combination with other agents. TA is a well-known antifibrinolytic agent used in menorrhagia. In 1979, Sadako reported an incidental observation of significant improvement of melasma in patients with chronic urticaria on TA. Ever since its first description, various in vitro and in vivo studies have been carried out to determine its mechanism of action, efficacy, and adverse effects. TA inhibits ultraviolet-induced activation of plasminogen by blocking the lysine binding sites on plasminogen and in turn downregulates the activators of melanogenesis. Topical TA (2%–5%) in various forms such as cream, gel, emulsion, solution, and mask has been studied in melasma. Initial report on topical 2% TA emulsion by Kondou et al. in 2007 showed promising results with improvement in 80% of the patients. Split-face trials on TA and HQ have shown significant clinical improvement in melasma compared with baseline, but the difference between the two groups was not statistically significant.,A recent randomized study from Tehran comparing 5% TA and 2% HQ in 60 cases of melasma also showed results similar to previous studies indicating that topical TA is as effective as HQ in melasma. Mild erythema and irritation was observed in 19 of 50 patients in HQ group and it occurred during the beginning of the treatment [Figure 5], whereas only 3 of 50 patients of TA group complained of irritation, which subsided on using freshly prepared solution of TA. The occurrence of adverse effects with HQ was significantly higher when compared to TA (P < 0.05) and this could explain better patient satisfaction with TA observed in our study (P = 0.03). Topical TA solution is easy to formulate, effective, and safe in the treatment of melasma in Indian skin. However, the limitations in our study include short duration of study and difference in the type of preparations used for comparison. Further large-scale studies are required to find out its ideal concentration, type of vehicle, and frequency of usage, and to evaluate its efficacy in combination with other treatment modalities for long-term benefits. Pasricha JS, Khaitan BK, Dash S. Pigmentary disorders in India. Dermatol Clin 2007;25:343–52. Pichardo R, Vallejos Q, Feldman SR, Schulz MR, Verma A, Quandt SA, et al. The prevalence of melasma and its association with quality of life in adult male Latino migrant workers. Int J Dermatol 2009;48:22-6. Werlinger KD. Prevalence of self-diagnosed melasma among premenopausal Latino women in Dallas and Fort Worth, Tex. Arch Dermatol 2007;143:423-31. Sivayathorn A. Melasma in Orientals. Clin Drug Investig 1995;10:34-40. Bandyopadhyay D. Topical treatment of melasma. Indian J Dermatol 2009;54:303-9. Arora P, Garg V, Sonthalia S, Gokhale N, Sarkar R. Melasma update. Indian Dermatol Online J 2014;5:426-35. 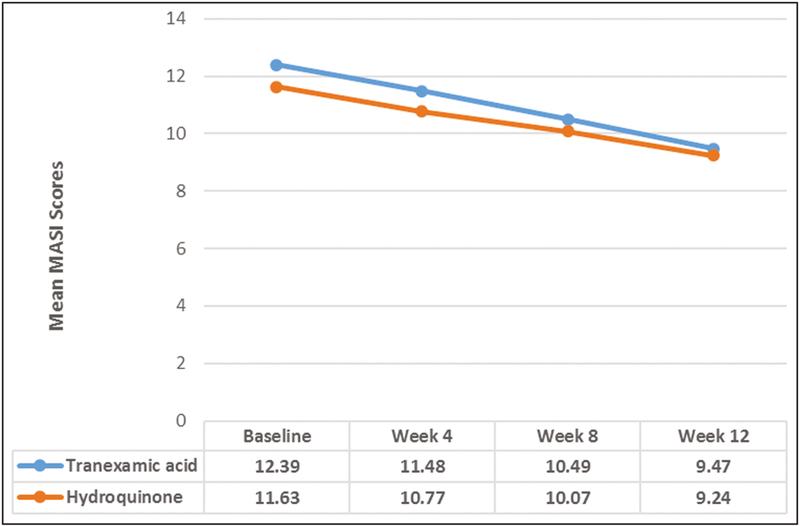 Kanechorn Na Ayuthaya P, Niumphradit N, Manosroi A, Nakakes A. Topical 5% tranexamic acid for the treatment of melasma in Asians: A double-blind randomized controlled clinical trial. J Cosmet Laser Ther 2012;14:150-4. Ebrahimi B, Naeini FF. Topical tranexamic acid as a promising treatment for melasma. J Res Med Sci 2014;19:753–7. Atefi N, Dalvand B, Ghassemi M, Mehran G, Heydarian A. Therapeutic effects of topical tranexamic acid in comparison with hydroquinone in treatment of women with melasma. Dermatol Ther (Heidelb) 2017;7:417-24. Sheth VM, Pandya AG. Melasma: A comprehensive update: Part I. J Am Acad Dermatol 2011;65:689–97. Sadako N. Treatment of melasma with tranexamic acid. Clin Rep 1979;13:3129-31. Dashore S, Mishra K. Tranexamic acid in melasma: Why and how? Indian J Drugs Dermatol 2017;3:61-3. Kondou S, Okada Y, Tomita Y. Clinical study of effect of tranexamic acid emulsion on melasma and freckles. Skin Res 2007;6:309-15. Banihashemi M, Zabolinejad N, Jaafari MR, Salehi M, Jabari A. Comparison of therapeutic effects of liposomal tranexamic acid and conventional hydroquinone on melasma. J Cosmet Dermatol 2015;14:174-7.